Intense eczema itch?! Allergies attacking?! 😱 Try out this super effective natural anti-histamine remedy, essential oils! TriEase® Softgels were developed to protect against seasonal and environmental elements and to promote a healthy respiratory system when needed most. Each softgel contains equal parts of Lemon, Lavender, and Peppermint essential oils, known for their ability to maintain clear breathing and a healthy immune response when combined together. I used to be a sneezy, itchy, watery eyed mess, but since adopting a whole foods plant based diet my allergies have become less intense with each season. I used to pop OTC anti-histamines like candy, but I’ve gone to more natural remedies and have found these to work great without the side effects that conventional anti-histamines have! I will also diffuse these 3 essential oils which allows me to breathe in the oils and get all of their medicinal benefits! Some of my customers like to purchase the oils that make up the TriEase capsules (lavender, lemon, peppermint) separately and a bottle of veggie capsules which allows them to make the allergy capsule themselves (2 drops of each oil diluted with a carrier oil like fractionated coconut oil). Buying them separately also allows the customer to use the oils for different remedies. For children it is best to diffuse these oils and you can also apply them to the soles of the feet diluted with a carrier oil like coconut, jojoba, olive etc. If you would like to purchase these products you can do so by clicking HERE. Just click on the “shop” tab and you’re on your way! By purchasing from me you help to support my small family business! You can also see more information about these high quality, therapeutic food grade oils and how they ethically source them at this website: http://www.sourcetoyou.com This company ships to many countries and has two warehouses in Europe as well, so if shipping is a concern don’t worry, you won’t have to wait weeks to receive it from the USA. Just reach out to me for more shipping questions or concerns at eczema.holistic.healing@gmail.com . I like to use lavender essential oil in my DIY lotions and creams, apply to my scalp with tea tree oil for anti itch/anti dandruff properties, and diffuse and inhale with a drop in my palms for a calming effect. Place 1-2 drops under the tongue, or take in capsules. Can also be used in beverages or as a flavoring in cooking. Can be applied neat (with no dilution) when used topically. Apply to reflex points and directly on area of concern. Properties: Analgesic, anticoagulant, anticonvulsant, antidepressant, antifungal, antihistamine, anti-infectious, anti-inflammatory, antimicrobial, antimutagenic, antiseptic, antispasmodic, antitoxic, antitumor, cardiotonic, regenerative, and sedative. Possible Uses: Lavender is a universal oil that has traditionally been known to balance the body and to work wherever there is a need. If in doubt, use lavender. It may help anxiety, arthritis, asthma, body systems balance, bronchitis, bruises, carbuncles, cold sores, earaches, fainting, gallstones, relieve headaches, heart irregularity, reduce high blood pressure, hives (urticaria), hysteria, insect bites and bee stings, infection, influenza, injuries, repel insects, laryngitis, migraine headaches, mental clarity, mouth abscess, reduce mucus, nervous tension, pineal gland (activates), respiratory function, rheumatism, skin conditions (eczema, psoriasis, rashes), sprains, sunstroke, throat infections, tuberculosis, typhoid fever, and whooping cough. French Medicinal Uses: Acne, allergies, burns (cell renewal), cramps (leg), dandruff, diaper rash, flatulence, hair loss, herpes, indigestion, insomnia, lowering blood pressure, lymphatic system drainage, menopausal conditions, mouth abscess, nausea, phlebitis, premenstrual conditions, scarring (minimizes), stretch marks, tachycardia, thrush, water retention. Historical Uses: During Medieval times, people were obviously divided on the properties of lavender regarding love. Some would claim that it could keep the wearer chaste, while others claimed just the opposite––touting its aphrodisiac qualities. Its list of uses is long. Body System(s) Affected: Cardiovascular System, Emotional Balance, Nervous System, Skin. Aromatic Influence: It promotes consciousness, health, love, peace, and a general sense of well-being. It also nurtures creativity. Check out this video on the distilling process of lavender! Lemon essential oil is great to diffuse for an uplifting aroma scent, and you can clean with it and even polish furniture! Place 1-2 drops under the tongue, or drink with a beverage. Take in capsules. Use as a flavoring in cooking. Can be applied neat (with no dilution) when used topically. Apply directly on area of concern or to reflex points. Avoid direct sunlight or UV light for up to 12 hours after using on the skin. Properties: Anticancer, antidepressant, antiseptic, antifungal, antioxidant, antiviral, astringent, invigorating, refreshing, and tonic. Possible Uses: This oil may be beneficial for aging, soothing broken capillaries, dissolving cellulite, clarity of thought, debility, digestive problems, energy, gallstones, hair (cleansing), promoting leukocyte formation, liver deficiencies in children, memory improvement, nails (strengthening and hardening), nerves, nervous conditions, respiratory problems, cleaning children’s skin, sore throats, and promoting a sense of well-being. It works extremely well in removing gum, wood stain, oil, and grease spots. It may also brighten a pale, dull complexion by removing dead skin cells. French Medicinal Uses: Air disinfectant, anemia, asthma, cold, fever (reduces), germicide, gout, heartburn, intestinal parasites, red blood cell formation, rheumatism, throat infection, ureter infections, varicose veins, water purification, white blood cell formation. Historical Uses: Lemon has been used to fight food poisoning, malaria and typhoid epidemics, and scurvy. (In fact, sources say that Christopher Columbus carried lemon seeds to America—probably just the leftovers from the fruit that was eaten during the trip.) Lemon has also been used to lower blood pressure and to help with liver problems, arthritis, and muscular aches and pains. Body System(s) Affected: Digestive, Immune, and Respiratory Systems. Aromatic Influence: It promotes health, healing, physical energy, and purification. Its fragrance is invigorating, enhancing, and warming. I like to use peppermint essential oil in my diffuser and inhaling with a drop in the palm of my hands. I will add it to a DIY toothpaste recipe too. It can be used on the spine to reduce fevers as well. Place 1–2 drops under the tongue or in a beverage. Take in capsules. Use as a flavoring in cooking. Can be applied neat (with no dilution), or dilute 1:1 (1 drop essential oil to 1 drop carrier oil) for children and for those with sensitive skin when using topically. Apply to reflex points and/or directly on area of concern. Properties: Analgesic, antibacterial, anticarcinogenic, anti-inflammatory, antiseptic, antispasmodic, antiviral, and invigorating. Possible Uses: This oil may help anger, arthritis, colic, depression, fatigue, food poisoning, hysteria, inflammation, liver problems, nerves (regenerate and support), rheumatism, seizures, elevate and open sensory system, soothe and cool skin (may help keep body cooler on hot days), toothaches, tuberculosis, and add flavor to water. French Medicinal Uses: Asthma, bronchitis, candida, diarrhea, digestion (aids), fever (reduces), flu, halitosis, heartburn, hemorrhoids, hot flashes, indigestion, menstrual irregularity, migraine headache, motion sickness, nausea, respiratory function (aids), shock, skin (itchy), throat infection, varicose veins, vomiting. Historical Uses: For centuries, peppermint has been used to soothe digestive difficulties, freshen breath, and to relieve colic, gas, headaches, heartburn, and indigestion. Body System(s) Affected: Digestive System, Muscles and Bones, Nervous and Respiratory Systems, Skin. Aromatic Influence: It is purifying and stimulating to the conscious mind and may aid with memory and mental performance. It is cooling and may help reduce fevers. Check out some reviews from my happy customers!! So thankful for Jen introducing essential oils in my life. I purchased the oils and capsules separately and experienced with them. I put 2 drops of lemon, lavender, and peppermint in a capsule when I felt itchy and a few minutes later I felt the itch decrease dramatically. Not only are these oils good for helping the itch go away there are also so many other ways to use these oils. I mix shea butter and lavender oil and rub it on my dry skin. Not only does it leave my skin moisturized it also leaves it smelling good. I use the lemon essential oil in my water when I wake up in the morning on an empty stomach for a little boost of detoxing. And the peppermint I put a couple drops in my pillow to help me sleep at night. Essential oils will change your life and are a big help to getting clear skin! 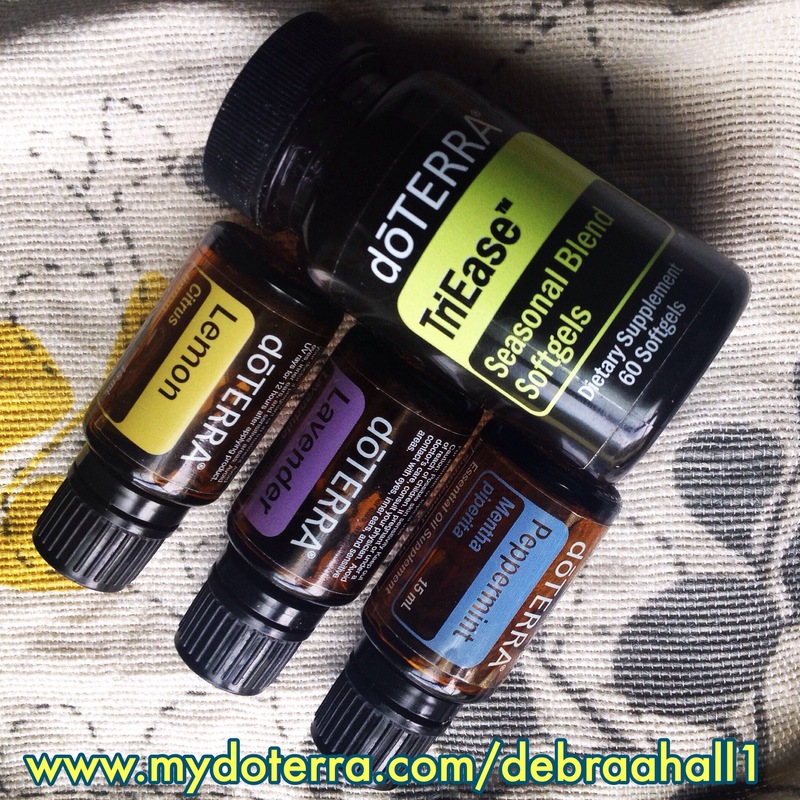 I am obsessed with the TriEase essential oil mix Jen recommended to me! Recently on a trip, I was having crazy allergic reactions to certain foods and my face with puff up and get crazy inflamed and my lungs would feel like they were closing up. I would take two of the pills and it would disappear within the hour. I can internally feel it cooling me down and now I’m a lifer with this blend! The TriEase capsule is amazing, they are clear vegan capsules and it works wonders. One day I woke up with my nose running and my face was swollen. So, I took two capsules and put 4 four drops of each essential oils in it. An hour later, my nose stopped running and the swelling went down completely. I felt so much better that I was relaxed that my body cools down and the capsules helps sore muscles as well if you work out heavy. These essentials oils are amazing. I uses lavender oil on my eczema when it starts itching and it helps tremendously. It calms down the itching in 2 seconds and the next few days my eczema has been disappearing. The peppermint oil I put few drops on my pillow to help me sleep better at night. To all the TSW you guys are warriors remember that don’t stop because you don’t see the results right away. Its a process to get to the roots of your skin to have beautiful skin! Thanks Jen!